The tomatoes and jalapeno sizzled on the stove. Occasionally, Mayra would give them a flip with her tongs to check to see if the skin had begun to blister. She looked up at me, smiling, and pointed at the charred bits, saying, without words, "This is how it should look." From there, Mayra motioned for me to go to the molcajete, where I awaited for her next instructions. The jalapeno was tossed into the bowl along with minced garlic. A quick demonstration on how to grind the pepper and the reins were passed to me. The tomato were added, smashed and then gently stirred in, along with cilantro, lime juice, and a generous sprinkle of salt. How simple this was, I thought, and, yet, I had never thought to make salsa this way. The eggs were prepared on top of crispy corn tortilla (which Mayra had made fresh the night before). I assisted in basting each one with hot oil (I was mostly successful in not splashing the oil all over the stove and my arms). The culinary lesson was a generous one and a highlight from our trip to Mexico. Set a stovetop-safe baking pan or griddle over high heat. Cook tomatoes and jalapeno, turning occasionally, until charred on each side and the skin is blistered; approximately 10 minutes. In a bowl, smash the jalapeno and garlic with a spoon until thoroughly combined. Add tomatoes and, using a pastry cutter, smash until blended. Stir in cilantro and lime juice and season with salt, to taste. Set a medium-sized sauté pan over high heat. Add oil and heat for 2 minutes. Carefully place a corn tortilla into the hot oil. It will begin to crisp and bubble. 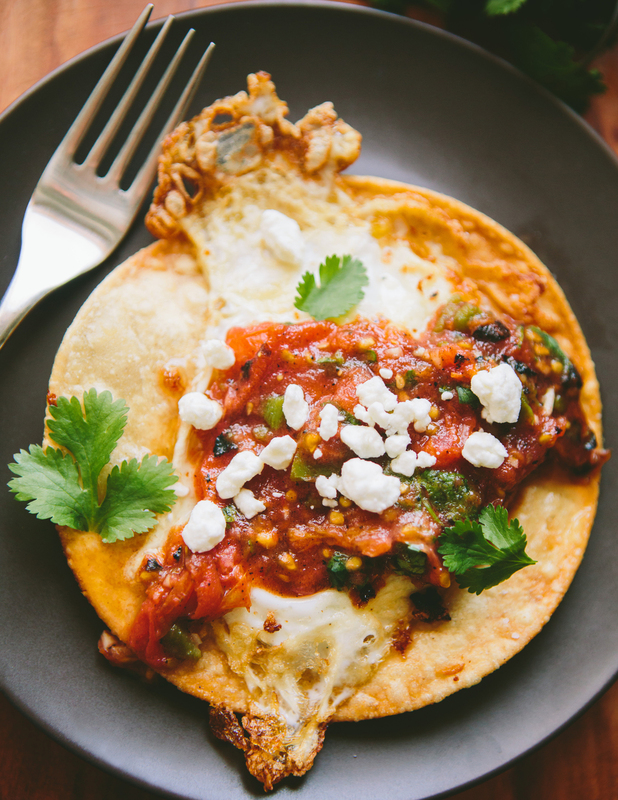 After 10 seconds, crack the egg directly over the corn tortilla. Making sure not to splash the oil too much (be very careful not to get any on you), baste the egg with the hot oil using a spatula or spoon. Cook until the whites have just set. Season with salt and transfer the tortilla and egg to a plate. Repeat with remaining eggs. Once they’re done, serve them with salsa on top and a sprinkle of goat cheese and cilantro.